My husband and I got our Christmas tree today, went to a few holiday parties over the weekend, our home is lit up like Rockefeller Center, and custom wedding welcome gifts for winter weddings are well underway. I guess it's about time I post my Thanksgiving recap. Better late than never, right? This year was my first time hosting. I quickly learned that Thanksgiving is essentially the Olympic Games for cooking. My amateur skill set of finding and following one lone recipe wasn't going to cut it. It requires juggling a gazillion different dishes at various temps with limited oven space and having all gazillion dishes be finished and served hot all at the same time. And by the way, turkey necks are gross and gravy is intimidating! I'm proud to say that I rocked it! All sixteen guests had at least seconds and even took leftovers home. Score. But just between you and me, the food wasn't my focus. Don't tell anyone but I didn't even grocery shop until the day before. 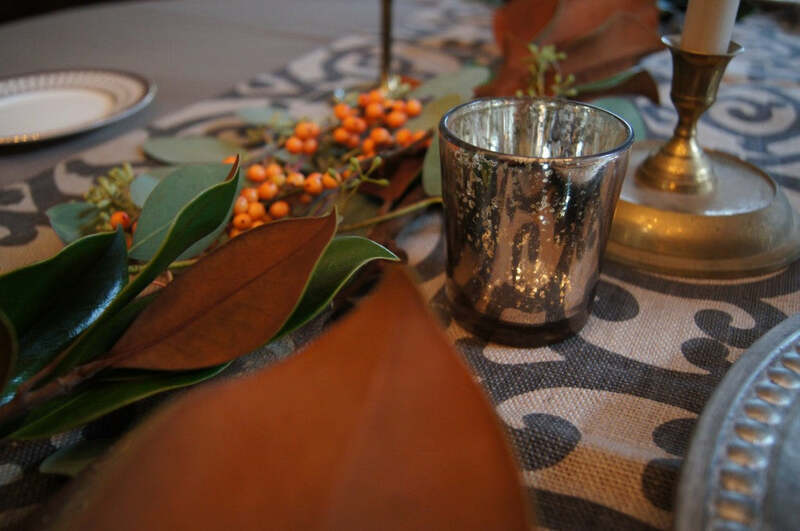 My focus was, of course, the tablescape! I was determined to use mismatched items I already had and make them look beautiful together. Would've been easier to rush out and buy new but I admit, I loved the challenge! 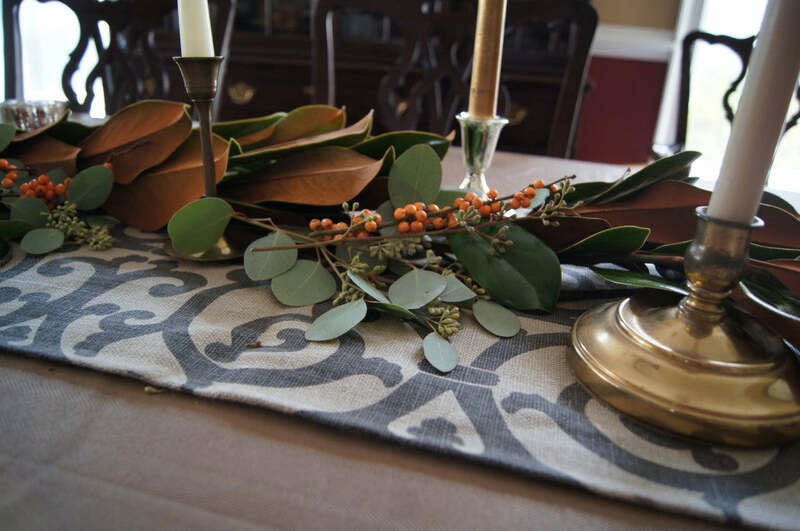 I centered the design around the homemade table runners leftover from our October 2012 wedding. I also located the metal lanterns we used and spruced them up by adding new candles. Brought back such special memories especially since all of our Thanksgiving guests were also present for our wedding day and some even remembered the table runners. 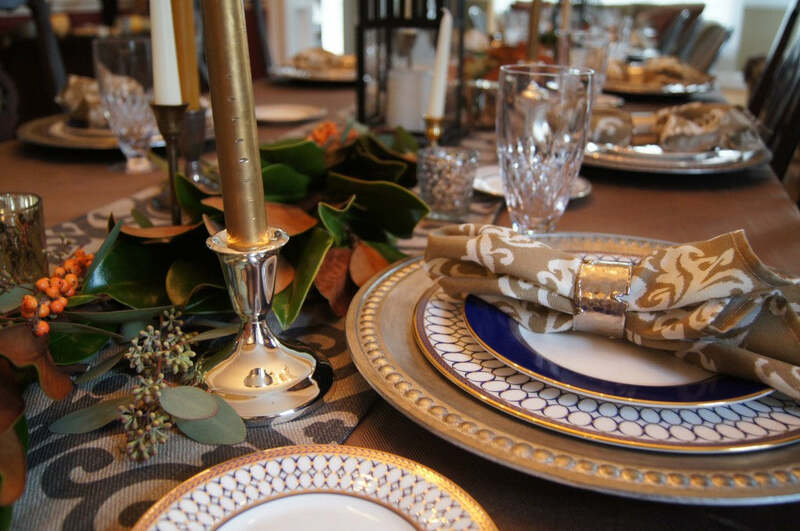 So exciting to set the table with our wedding china! 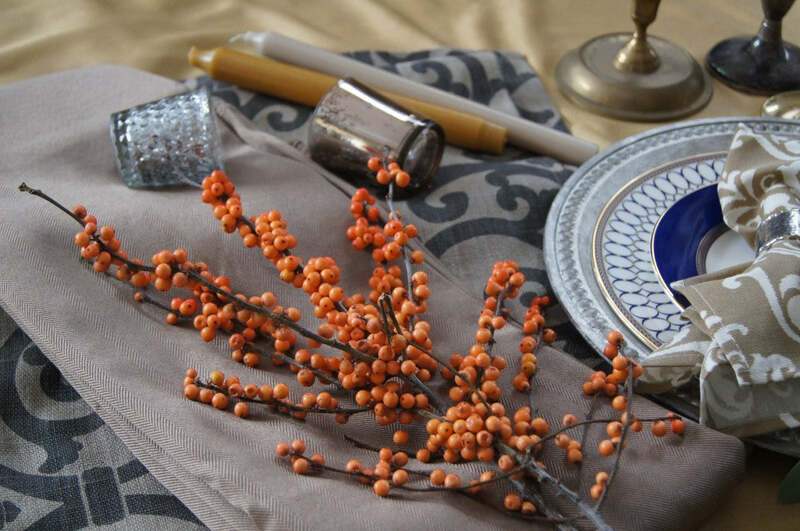 Blue isn't traditionally such a Thanksgiving color but the blue looked gorgeous with the golds, browns and charcoal grey. 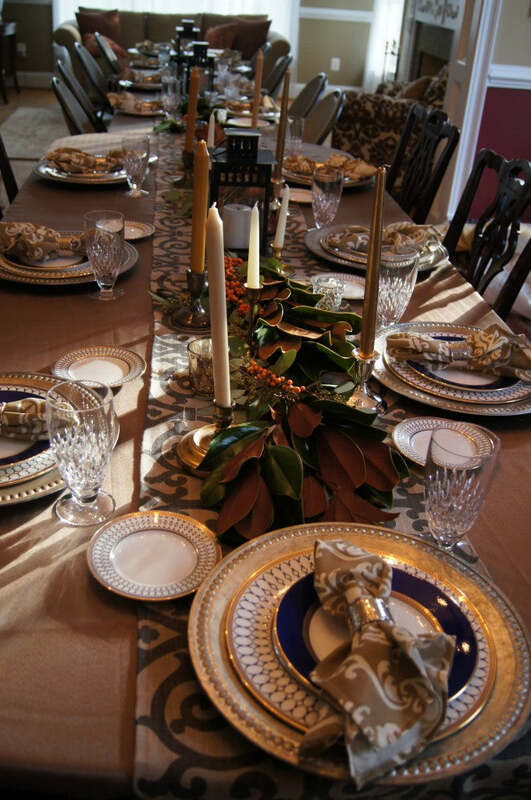 I also paired fairly casual silver chargers with the fine china, both gifts from family present at the table. 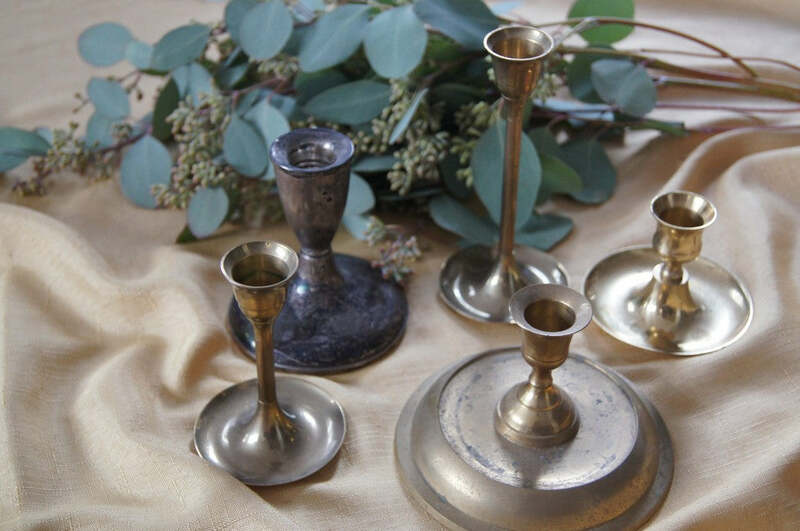 The candles and candlestick holders were thrift shop finds. Some were dull. Some were shiny. Some were gold. Some were silver. 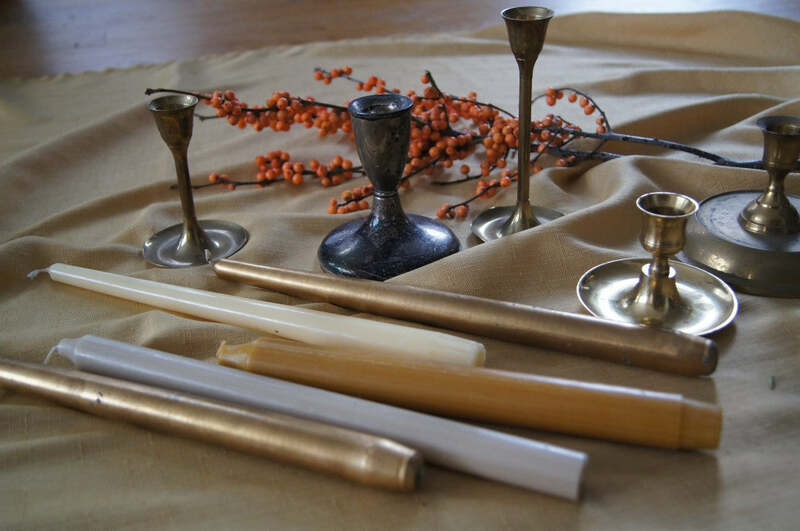 I also added some mercury glass votives for contrast. It all seemed to work. And my favorite part...the greenery. (The only part I purchased new). 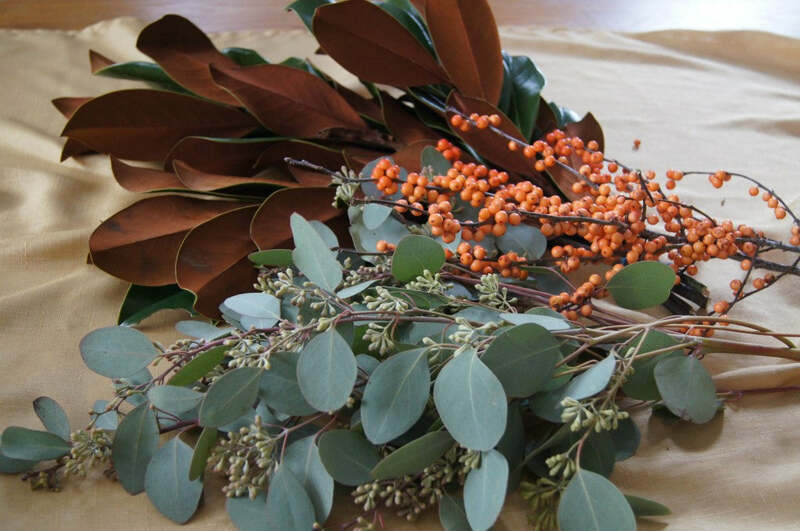 I extended a combination of magnolia, seeded eucalyptus and bright orange berries down the length of all three tables. It pulled the entire design together and smelled amazing. Now, onto Christmas! If you're searching for a hostess gift for a Christmas party, you will want to visit this page right now!